Up to this point, Hettie had had her worn out cassette, her old bar tape and bars removed, her ergo 9sp controls taken off, and her wonderful but uncomfy Brooks saddle removed. And thus, she lived in the cottage until a certain Easter rainy weekend. Here she is, ready for a re-vamp. I am very grateful to my fantastic hubby, for a number of things, firstly, he lets me go out into the world to ride my bikes, pretty much where I want to go to. Secondly, he is a mechanic, and very able to adapt to most mechanical things, be them motorbike (vintage or classic), car (classic) or computers (retro or new). But, he cannot forget his humble beginnings in Jane Whites Cycles on the Isle of Man, many moons ago (Even before we started dating at the sweet age of 17). 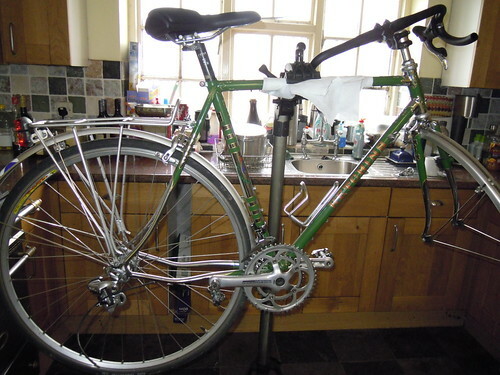 It is to his knowledge, his experience and skills that I allowed myself to have a go at upgrading Hettie Hetchins from a 9sp to a 10sp, and to totally change her groupset, her handlebars and bar tape. It is due to this man, that the 'rocket science' behind the bicycle that I had been so worried (scared) to venture into, and that the veil of difficulty, complication and well.... the unknown was broken and left in pieces on the floor. It can be done folks, and .... it wasnt THAT difficult either! (But a bit of man power was required once in a bit). 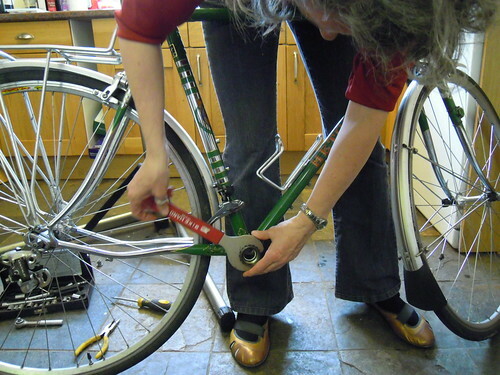 First of all, once Hettie was pretty much naked (her cassette removed, her bars taken off, her chain dismantled) that the real work was to begin, it was one thing taking it all off her, and another putting it all back on. For one thing, it has to be right, and to fit and to look good on her. 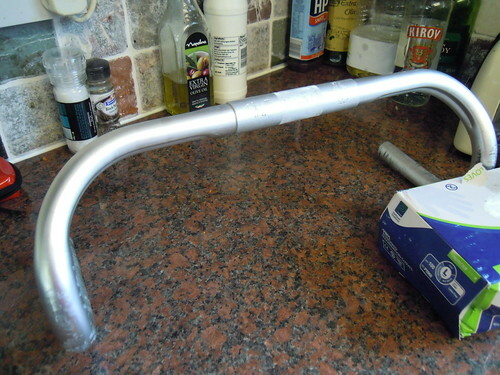 And because of the 'look good on her' demand, that I removed the new handlebars purchased. 'Shed Man' didnt like them, and as the days passed, and Hettie and I clocked one another in the hall way, I grew more and more to agree. The blackness of the new bars was wrong, but more than that, the 'oversized' nature of them was too new, to a frame built to look retro. So I scoured the internet, and ended up buying a pair of 42cm Cinelli bars from that famous auction site. They were from the late 80's, and best of all, had double groves for the control cables, and they were in silver! I hated the blackness of the new bars, and it was impossible to buy bars that were proper silver alloy, and not painted or carbon. These were perfect. Cept a bit dirty. So I set forth on Hetties rebuild day to make them suitable for her. 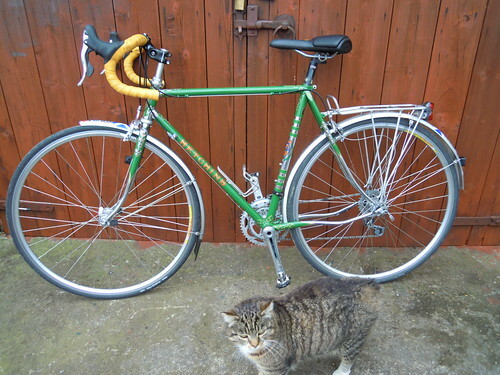 The new alloy silver Cinelli bars for Hettie, she hated those other black jobbies. Needing a good clean up. 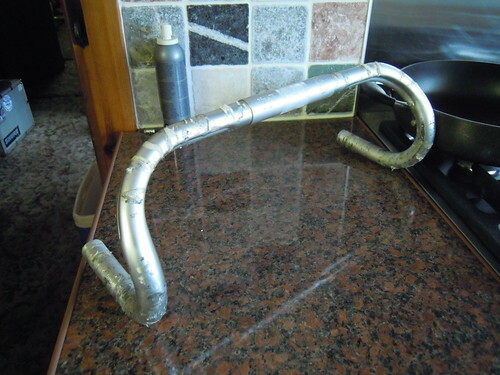 The original bars, now going onto Ebay, as I didn't like them on Hettie. Next part of the operation: To remove her chainrings and cranks. This was where a bit of 'man power' was required. Shedman soon knew which tool we required and disappeared into his shed for the right bit. It was a half inch or a 10mm hex drive according to shedman. This was to loosen the two halfs of the cranks. 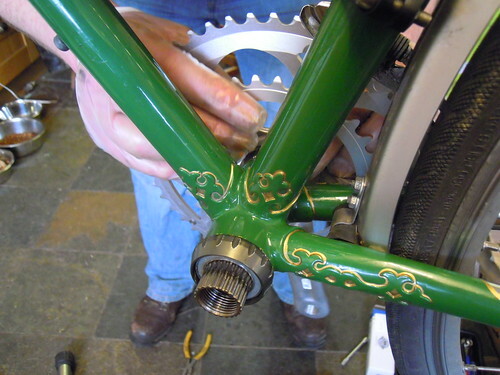 He was somewhat surprised to see the pieces of the spindle in two halfs rather than one long spindle on which the pedal crank was attached to...Anyway, it was soon removed. Once the cranks and chainrings were taken away, I got to see inside the lower part of the Hetchins frame for the first time. And yes, it was very mucky and rusty in there, considering Hettie lived indoors and was mostly, but not always ridden in sunshining days. It was wiped clean with ethanol, and once dried a good salve of grease added. Next, the special BB cups (bottom bracket) were screwed into place, I had to replace the old ones, which were well... worn out to be honest. As I was changing from Campagnolo Ultra Torque to Campagnolo Power Torque, new BB cups were required. Here I am fitting these into place. Screwing on the new bb Power Torque cups. BB cup fitted in place. The chainring and crank getting fitted into place. Mick kindly introduced me to Miche components, and I purchased a Campagnolo compatible rear cassette. I ended up with a 13/29. 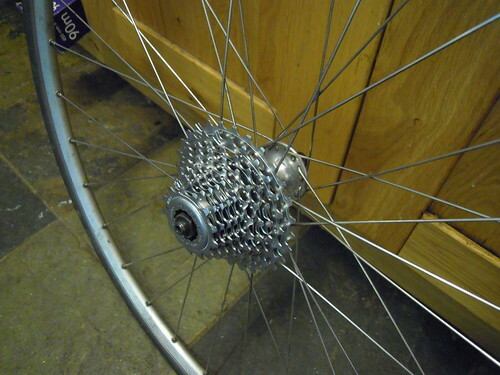 Shedman and I were both nicely surprised at how easily the cogs fitted to the rear hub. 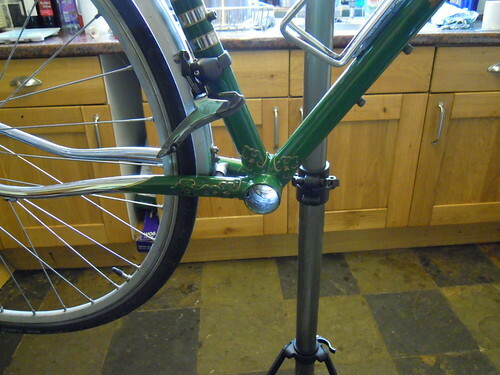 Some how in the post, they had become unattached to one another, but nicely paired up with the rear hub groves, they could only fit one way, so you simply couldn't make an error with this part of the re-build. The locking ring secured them all. Once the rear cassette and the front chainrings in place and secure, I was able to spend some time fitting the old Cinelli alloy bars to Hettie. 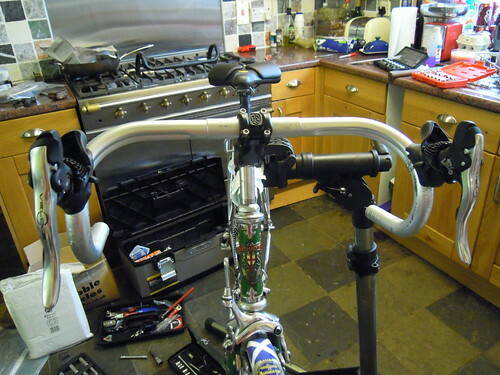 I had to remove the new 10sp controls, re-fit these, and attach the bars to her stem. Nice and simple like. Bars in place, with 10sp ergo controls. They do look a lot nicer than the black ones dont they? Threading up next. When you buy Campagnolo cables, they come with 2 x thick cables (brakes) and 2 x finer cables (gearing) the really long gearing cable was for the rear derailer, and the shorter one for the front derailer. The brake cables were self explanatory, once we both scratched our heads as to where the cables were threaded into the ergo bars that is... The stupid diagrams supplied by Campagnolo assume that a) you have done this many times before, therefor a tiny weeny rubbish diagram is all you need (but dont use of course), and b) you have such fantastic eyesight that the tiny weeny rubbish diagram is of a size in the pamphlet that you can see! Basically, the diagrams are horrible! You need YouTube, and you need to spend some time looking for little holes, and pulling up the rubber weather protective covers, that like to turn your fingernails inside out – ouch, ouch, ouch. I am still nursing sore fingers, but the deed was done, the holes were finally found! Hettie ready for her indexing next. A slight possible future problem as discovered once Hettie was flipped upside down. Where her front gear cable disappeared over her BB area, the frame had been rubbed, and as the new cable was again going in the same place, Shedman thought some nylon would help prevent future damage, sealed with silicon glue it wont be seen from above, but might prevent road and weather corrosion from below so to speak. 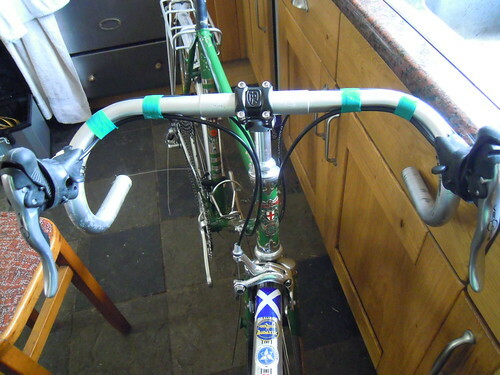 And finally, the bit I found MOST stressful, but also sort of most enjoyable too, was the bar tape. She was now sporting Cinelli bars. So instead of replacing the bar tape with Brooks leather, I stepped up a bit, and purchased the lovely Cinelli leather bar tape. Much thicker than the Brooks, it was also quite stiff and I was worried about its application, as this will be my first ever bar taping session. Back to YouTube for the answer. 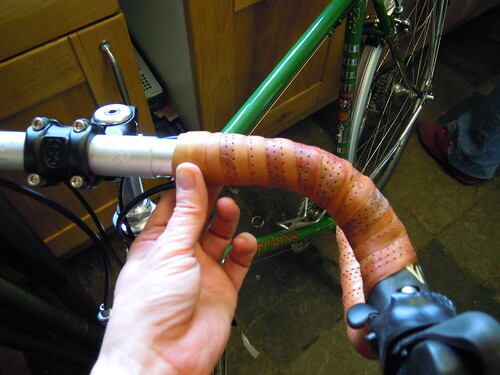 There were plenty of videos to choose from, and I kept one for the application of leather bar tape and watched it about 20 times! Then I took a practice run, using the old Brooks tape, then I simply let go of the edge into free fall, and did the job myself! Finally, there she is... done. All indexed, running smooth (I had ridden her about 3 miles before this pic was taken, she still needs her cables clipping, but I have no farls, and need to get some before this can be done). Posted by Mary on April 9th, 2012. Well done, Mary. 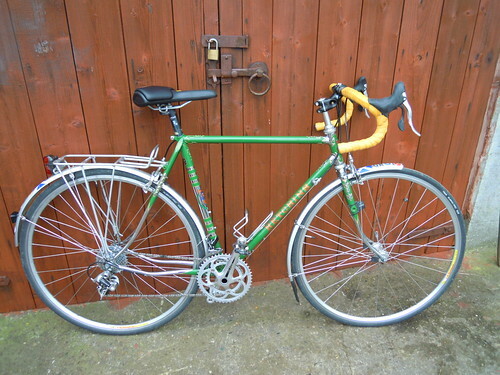 I still haven't put my Coventry Eagle Touristique back together yet, despite picking up the frame before Christmas. 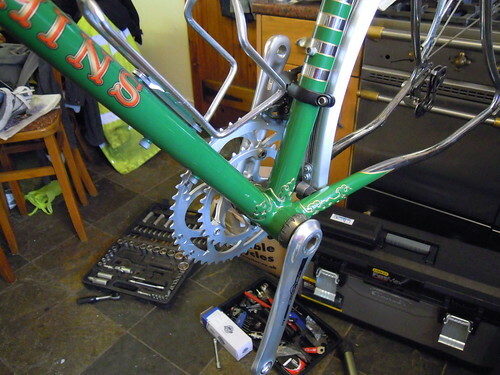 I think I'm frightened of seeing all the paint come off when I start tightening things up; the quick release skewers are going to chew in to the dropouts and I wish I'd taken a photograph of the position of the front derailleur (I have eliptical chainrings) before I took it off. Ditto the order of all the bits that make up the Simplex gear levers. Ver-ry impressive ... I couldn't follow it all, but it looks like a major overhaul. Glad that you and Shedman survived the ordeal – 17 is an impressive number, one to be proud of regardless of the outcome, and even better for a success! After all that money spent on a beautiful restoration i can see in the photos where you have made cutbacks. Kirov vodka! A nice bottle of Smirnoff Black would be better. Well done Mary (and hubby) that was a major project to take on! I really enjoyed reading this and particularly the great series of photos – it takes great presence of mind to take photos all the way thro – I don't usually think of it until later! I absolutely agree about silver bars. Roberta originally had black bars and I didn't like them at all. To my delight I found the exact same bars in silver on Planet X at much reduced price. I chickened out of fitting them tho – I've got a quill stem and I doubt if I could get new bars in without scratching them. 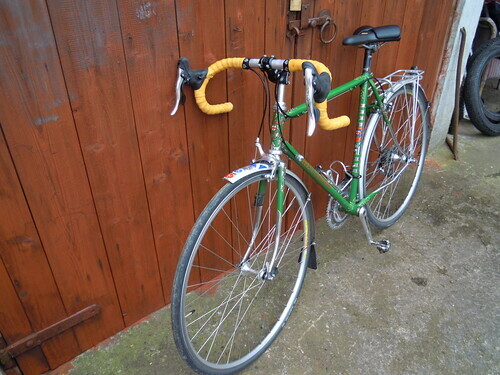 Roberts did the job for me and new bar tape too. 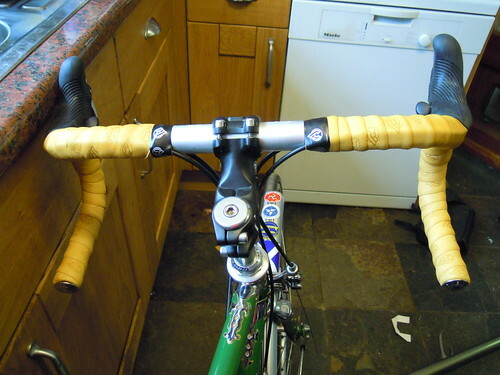 You made a great job of Hettie's bar tape, she looks lovely. Fantastic stuff – I've never been brave enough (or perhaps patient enough) to conduct such major surgery, although I too took the YouTube approach to bar tape last year. Loved the lugwork on the frame too. Nice work Mary. Looking good, and the bike will now feel even more 'yours' than before. The cable guides beneath the BB shell is a surprising detail if they are just steel tubes. 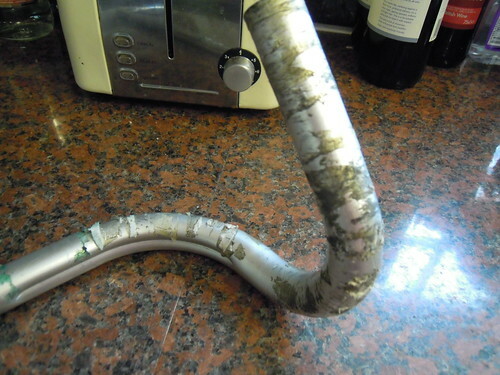 Even if the cable was clear of the shell, I would assume it will eventually rub a groove in the tube. It might be worth fitting a purpose made plastic guide at some stage. I suppose it could mean taking the bike back to the builder but worth thinking about in the long run IMO. 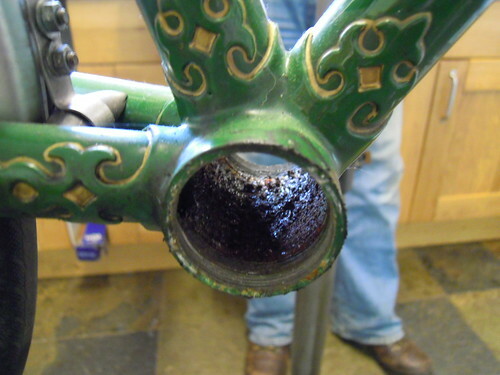 Also worth removing the BB and cleaning out the shell once a year as well (to prevent rust). 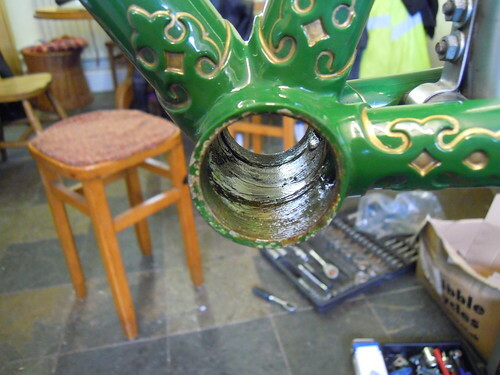 A lot of crud gets in there somehow, some of it probably down the seat post. I think you may have forgotten a bit of advice I gave you. 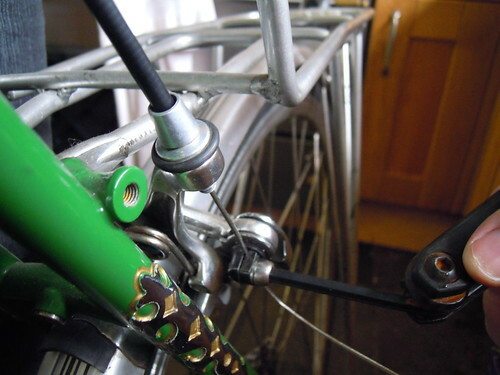 If the gear cables run RH to rear and LH to front as per the instructions, the gear cable outers rub on the head tube as they curve, and wear the paintwork. 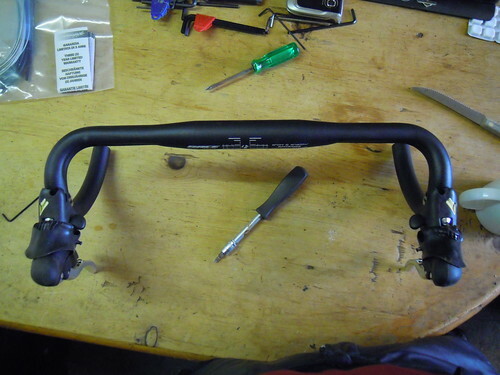 It is better to run the RH to rear cable down the LEFT HAND side of the down tube, and the LH to front down the RIGHT HAND side. 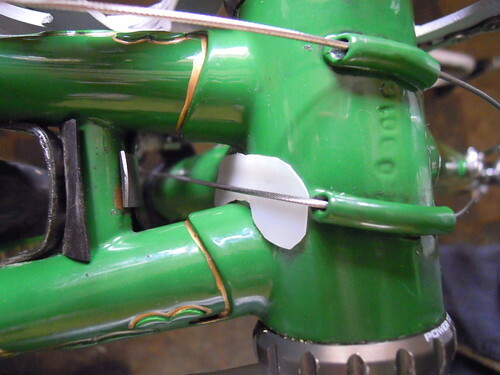 This makes a cross of the gear cable inners underneath the down tube but it doesn't matter. 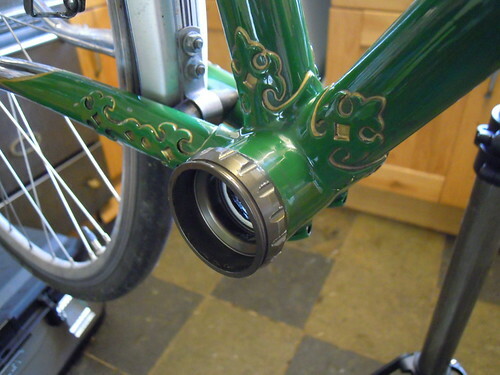 What it does do, is splay the gear outers wider at the front so they don't sit against the head tube. It's a great little dodge, and well worth the trouble. Don't think you have to do much from where you are now. 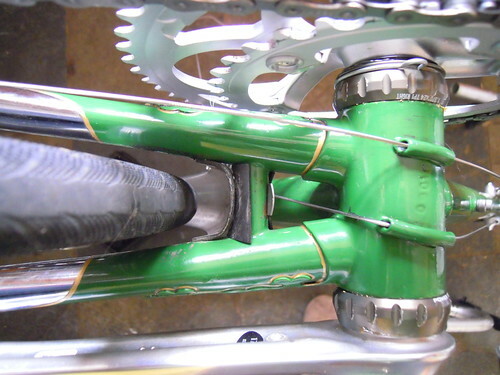 Just undo the inners from the mechs, swap the cables from one side to the other, and re-lace through the down tube adjusters but cross the inners before you go under the BB to the mechs. What a super job you made of the overhaul. I had a hetchins new in 1963 when I was 14 yrs old. It got a bit abused, then I restored it in 1963. I keep it under wraps as I almost got wiped out and the bike when I rode it to show workmates, when I worked in the garage.